PACCAR Australia managing director, Andrew Hadjikakou, officially presented the first locally-produced DAF CF85 prime mover to long-term supporters of DAF Trucks Australia, Cahill Transport. 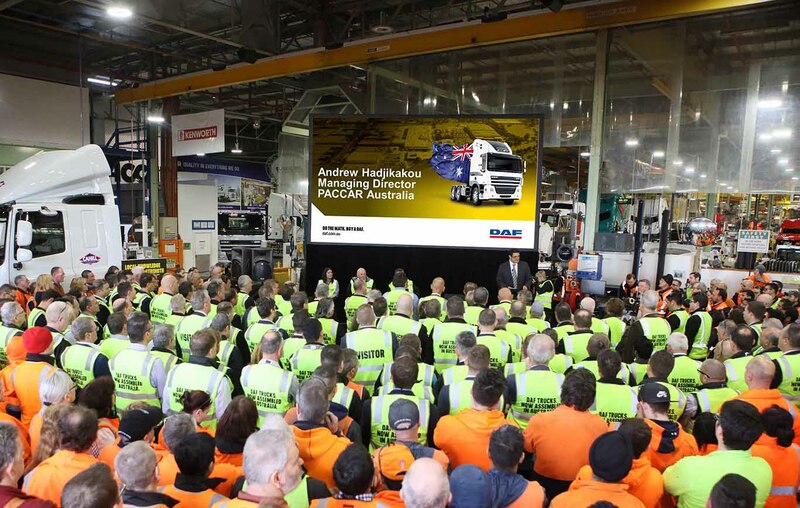 The historic event took place at PACCAR Australia’s world-class manufacturing facility located at Bayswater in Victoria, where the keys were proudly handed over to the Directors of Cahill Transport, Michael and Daniel Cahill, at the ceremony. The class-leading CF85 prime mover is the first Australian-produced DAF truck to travel down the production line, scheduled into build slots that have previously been occupied solely by Kenworth trucks for the past 47 years. The decision to locally produce the DAF CF85 will in time allow PACCAR Australia the opportunity to provide DAF customers with high levels of customisation through our local engineering team and local parts sourcing. PACCAR Australia is committed to providing new investment and manufacturing capabilities in Australia, and we are proud to say that DAF Trucks Australia is here for the long term.